HIMSS is the acronym for the Healthcare Information and Management Systems Society, but if you walked around the society’s massive show at Orlando’s Orange County Convention Center last month, you might have thought the “I” stood for image. The EHR remains the star at HIMSS, but increasingly that means radiology—and all the other specialties that produce images—are taking their relationship with EHRs toward a new level of enterprisewide image sharing. How that’s starting to develop was a major topic at HIMSS 2014 and certainly will impact radiology in the years to come. “Imaging decisions are no longer in the silo of radiology,” Louis Lannum, director of enterprise imaging for the Cleveland Clinic’s eight hospitals, told the audience during a presentation on his institution’s ongoing vendor-neutral archive (VNA) project. Lannum said the Cleveland Clinic is bringing images from about 60 different clinical departments that produce them for the medical record into the VNA, where they will be accessible through the organization’s EHR. He told the audience that the Cleveland Clinic’s definition for EHR inclusion is any clinical image referenced in a medical record. Currently, the Cleveland Clinic has approximately half of those 60 departments integrated into its VNA, according to Lannum. As the project progresses through the various image-producing departments, Lannum said he’s seeking a physician champion in each one to lead that department’s integration into the VNA. The VNA doesn’t yet handle video, but he said the organization plans to start tackling that piece of the archive later this year. The Cleveland Clinic and other forward-looking facilities provide a peek at the future of enterprise image and information sharing, admittedly a look further into the future for some organizations than others. One of Lannum’s key points about the Cleveland Clinic’s VNA project is that it’s about image access, not storage. “If you write an RFP [request for proposal] and give it to storage guys, all you’re going to get from them is storage. That’s what they do,” Lannum said. “[Our VNA] is not a storage strategy; it’s an EMR strategy,” he added. His point wasn’t to pick on the storage department; he was pointing out that the archiving function of his organization’s VNA is less static than the term “archiving” may imply. The core objective of the Cleveland Clinic’s project is to ultimately make every department’s clinical images available through its EHR. But to some in radiology, a VNA is thought of as the new “A” in PACS or perhaps the last data migration they’ll ever need. A VNA can serve that function, but that’s just one possible component of a VNA enterprise strategy. Many organizations set a big-picture goal of collecting all the data housed in separate information silos and bringing them together in one place, where they can be normalized, indexed, and ultimately used by the entire health care team to guide treatment decisions. Rasu B. Shrestha, MD, MBA, vice president of medical IT at the University of Pittsburgh Medical Center, used the term “health data liquidity” in his talk at HIMSS. He described the objective as “freeing the data from the shackles of the information systems designed to capture them in the first place” and making that data available at the workflow level. In the Cleveland Clinic’s system, a physician uses the EHR to schedule an event that will generate an image, which in turn creates a modality worklist entry. The physician or technician captures the image, matches it to the patient, and sends it back through the worklist, which applies the DICOM wrapper if it’s a non-DICOM image and sends it to the image repository in the clinic’s Agfa VNA. Lannum said one important reason DICOM was chosen is that it’s an established standard with good indexing capabilities. He also noted that most viewers are DICOM based. The Cleveland Clinic has different vendors’ PACS throughout its departments. Lannum said radiology uses an Agfa product, cardiology uses a Siemens product, women’s health uses a GE Healthcare product, and orthopedics has a Stryker system that helps surgeons plan for implant procedures. Within their respective departments, clinicians want to use the systems they’re already familiar with in their day-to-day work. To facilitate these image transfers to the VNA, Lannum said the clinic contractually requires its vendors to create a DICOM protocol to send from their systems to the VNA. The inbound protocol eliminates problems with the nonstandard tags vendors sometimes use. Putting every image into a DICOM wrapper allows one viewer to be used across the enterprise, a significant consideration when it comes to supporting the clinic’s 35,000 clinical computers. Putting several viewers on each workstation would create a time-consuming support challenge, Lannum noted. Not every VNA vendor or facility favors the all-DICOM approach. Some prefer to keep images in the native format, contending that using the native format makes it easier to work with the images on the originating department’s systems and saves storage space. Some are developing a viewer that handles different image formats through a common interface in the EHR. Not using DICOM and its indexing capabilities requires developing a different approach to track and manage images. While organizations are developing ways to put all their images into their archiving, there’s also the challenge of taking them out of the system as needed. Lannum said the Cleveland Clinic’s IT staff still is looking for a good set of life cycle management tools for its growing archive. Appropriately purging documents that are no longer needed and not required to be retained can save storage space. From a medicolegal perspective, any document in a system is discoverable in a lawsuit. While the Cleveland Clinic’s VNA project illustrates many of image sharing’s objectives and issues, it’s not the only viable solution or approach. At this point, there’s no single, agreed-upon VNA design. A key first step that was mentioned often at HIMSS is deciding what an organization wants its VNA to do. A large multisite organization such as the Cleveland Clinic has a broader set of enterprise needs than a community hospital. A radiology group serving multiple hospitals may seek an entirely different functionality in its VNA. Obviously, a DICOM-based archive makes sense for a radiology group, but a physician group’s priority would focus on delivering reports and managing, storing, and sharing images from their various clients. Radiologists want a system that lets them manage their different hospital clients from within a common workflow that can be used in their reading locations. That’s a different job than being a repository for various types of images from a range of clinicians. While image sharing across the enterprise is a major trend at HIMSS, in many places, it remains a relatively low-tech event. A large percentage of images still are shared between facilities by handing the patients a CD or USB jump drive loaded with images and a viewer and sending them back to the referrer. Companies have developed better tools for importing and managing these so-called sneaker net images. One popular tool for this job is the lifeIMAGE Local App (LILA), which allows images from most CDs or jump drives to be opened and displayed and then stored—all of which can occur outside the recipient’s PACS. LILA also includes tools that allow the physician to request an image be sent to the PACS, if desired. Tools such as the LILA app reflect the reality that CDs aren’t going away soon, even though lifeIMAGE offers a cloud-based platform to share images. 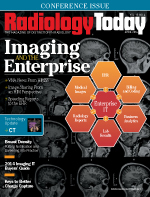 As image sharing increasingly becomes an enterprise issue that migrates toward direct exchange between computer systems rather than sending a CD and report, radiology’s homegrown IT crews can learn a great deal from the larger IT world with which it increasingly interacts. PACS grew out of CT and MR scanners that produced digital images. Whitfill likened PACS’ origins to a modality appendage rather than an IT service. He cited the example of Southwest Diagnostic Imaging’s PACS volume growth, which started with a single PACS administrator overseeing 100,000 exams in four locations in 2002. Whitfill served as Southwest Diagnostic Imaging’s chief medical information officer before moving to his current position. In 2014, 97 radiologists read 2 million exams from more than 20 locations, according to Whitfill. The scope of that task requires enterprise IT expertise that many radiology-grown PACS teams don’t have. Whitfill noted that enterprise imaging isn’t just a matter of radiology’s image volume growth and sharing those images. He pointed out in his presentation that California’s Kaiser Permanente organization now has more images coming into its system from outside radiology than it does in the imaging department. He advises that if your facility is planning or implementing a VNA in radiology, you should consider how it may handle visible light imaging, such as ophthalmology, dermatology, and endoscopic photos, in the next three to five years. Whitfill shared audience poll data from last June’s Society for Imaging Informatics in Medicine conference that illustrates the trend toward enterprise imaging. Thirty percent of those attendees reported that their organizations’ radiology PACS is managed by enterprise IT staff, while 37% reported management remained in radiology. Another 26% said management was mixed. When imaging volume and revenue growth were robust, the radiology department had a favored child’s access to hospital resources because executives knew those investments would produce excellent revenue returns. As reimbursement drops, volume flattens, and the anticipated transition away from fee-for-service reimbursement takes hold, that role will change. “For our organizations to be successful, we’ve got to find a way to do more with less,” Whitfill said. IT provides an opportunity to deliver on the requirement of doing more with less, as it has in other industries, but doing so will require IT to move out of the department and into the enterprise. That effort was on display at HIMSS.